Back in the day I used to exercise four times a week for about an hour. Now that free time is pretty much a thing of the past…I was lucky if I can get one proper workout a week (as perhaps many can relate to). Whether it’s for health or vanity, exercising and eating healthy have become hot topics in recent years…and there are plenty of apps that promise to whip its users into shape. 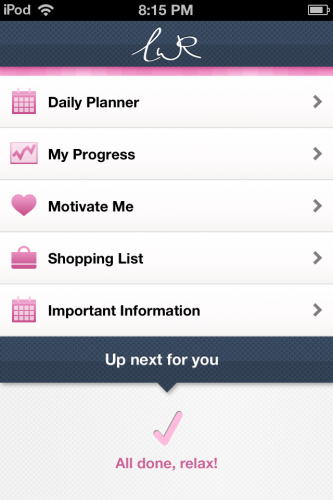 LWR Personal Trainer is an app that actually delivers. It’s developed by Lucy Wyndham-Read, a women’s fitness expert with over 15 years in the business. LWR Personal Fitness Trainer is a 28 day program for women that includes a meal plan and exercise routines. 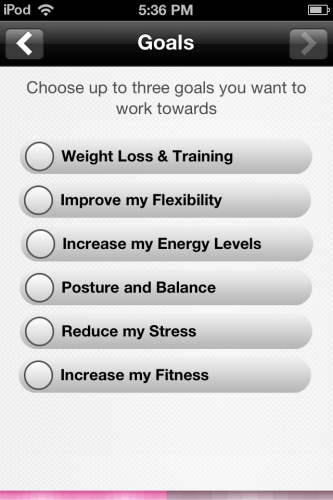 The program is customized by asking questions such as height, current weight, and to choose three goals (such as weight loss or reducing stress). I did have a problem with the app crashing after switching from kg to lbs when entering current and ideal weights but there was no problem entering it in kg or my height in feet/inches.